GENT, Belgium (VN) — Three years ago, Philippe Gilbert was at a crossroads. His contract was up at BMC Racing and he was wondering how he wanted to end his career. Already a world champion and a winner of two of cycling’s five monuments — Liège-Bastogne-Liège and Giro di Lombardia — the Belgian superstar felt he needed something new to get his cycling fix. Three years ago, Gilbert suffered the cycling equivalent to a mid-life crisis. Though he hails from the French-speaking Ardennes region and grew up near the base of Liège’s famous Côte de La Redoute, he is still Belgian to the bone. And while one half of Belgium is the Ardennes, the other half is Flanders. So in 2016, Gilbert shifted his gaze from the steep climbs of his backyard to the pavé and cobblestones of Flanders. That decision reached its full realization Sunday in the Roubaix velodrome when he won the “Queen of the Classics.” This isn’t the Gilbert of 10 years ago — he’s somehow become even more versatile. Well into his 30s, Gilbert had already done just about everything he could do with his natural skills. Unless he made a dramatic change, he was going to squeeze out another few years of a career, and maybe win a few more familiar races. That wasn’t enough. Instead, Gilbert sensed he needed a new challenge. 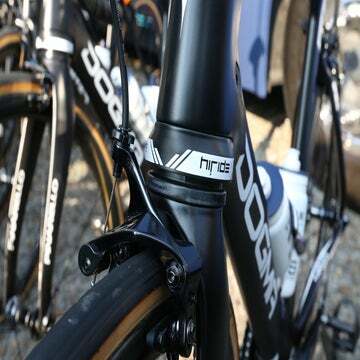 He emailed Deceuninck-Quick-Step boss Patrick Lefevere and said he wanted to race on the pavé. Lefevere didn’t have a huge hole in his budget, but he offered a relatively low-money contract packed with incentives. The deal was this: you win big races, we’ll give you big bonuses. Gilbert signed on and promptly paid back Lefevere with a solo victory at the Ronde van Vlaanderen in 2017. Flash forward 24 months and six days, and Gilbert backs it up with Roubaix. Winning Flanders wasn’t such a stretch for Gilbert. 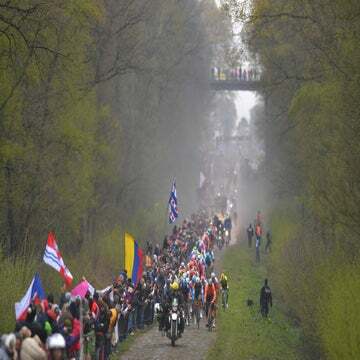 After all, the explosive cobblestone climbs of the Ronde are not that much different than what he had already been specializing in the hillier classics. But to truly commit to the stones, he needed to add brawn to withstand the punishment of the pavé and to still hold the power on the flats. Roubaix is another story. Perhaps the most incredible statistic about Gilbert’s Roubaix victory isn’t that he attacked with more than 65km to go. Or that he gapped Peter Sagan on the Carrefour de l’Arbre sector. Instead, it was that he won Roubaix in only his third try. His first Roubaix came back in 2007 when Gilbert was just emerging as a force in the peloton. By then, he was fully committed to the hills, winning Lombardia in 2009 and 2010. In 2011, Gilbert was untouchable in the spring classics, winning Brabantse Pijl, Amstel Gold Race, Flèche Wallonne, and Liège in a row. By 2012, his world title capped his upward trajectory. It’s not that Gilbert stopped winning after that, but he wasn’t winning as much. 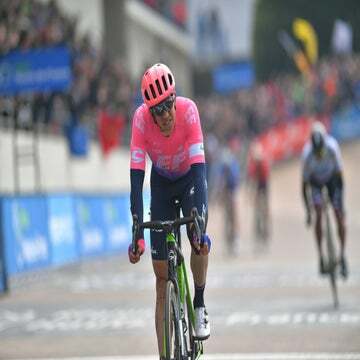 He added another Amstel Gold titles to the list of four and kicked to stages in the Giro d’Italia and Vuelta a España. But there were no more monuments, no more world titles. By 2016, Gilbert knew he needed a change, or retire. He wanted to win a few more big races and he wanted to race on Belgium’s biggest team. The deal was hashed out over a few emails delivered success sooner than anyone expected, with Gilbert winning Flanders and a fourth Amstel Gold in 2017. Finally, in 2018, he closed the circle and came back to Roubaix. Despite sky-high expectations, the Hell of the North tamed and even humbled him. Despite attacking early after coming off the Arenberg, he got swallowed up by Sagan and rode to 15th. He was a Roubaix rookie by any measure of the word at 35. Gilbert paid his dues, doing extra recons over the cobbles to better understand the mysteries of Roubaix. He knew how much his intimate knowledge of the roads around the Limburg and the Ardennes had helped him dominate Liège and Amstel Gold. He needed to know the pavé like the back of his hand, or, to put it another way, like a Flandrien. On Sunday, it was all about execution. He knew he had the legs, and he knew he had the team. More than anything, though, Gilbert wanted to win in the style of the heroes he grew up watching. Gilbert attacked initially with about 65km to go, way too far against a biting headwind. When teammate Yves Lampaert trailed behind Sagan and Wout van Aert (Jumbo-Visma), Gilbert’s bet was looking pretty good. Lampaert said in the chaos of the closing 30km, they didn’t have much chance to speak. One thing was clear, and that was to attack. Lampaert took a big dig, and then Gilbert countered to surge clear to put Sagan on the ropes. Van Aert succumbed to earlier efforts and Sep Vanmarcke (EF Education First) was struggling with bike issues. Only Nils Politt (Katusha-Alpecin) could follow. Gilbert’s victory puts him in elite company. Only a handful of riders have won races as diverse as Flanders, Roubaix, Liège, and the world title. And thanks to a mid-cycling life crisis, Gilbert has now won the Tour of Flanders and Paris-Roubaix in a span of barely 24 months. With four of five monuments now in his pocket, he’s only missing Milano-Sanremo to finish out the set. Maybe he can reshape himself into a sprinter. Or better yet, just uncork a long attack over the Cipressa. What Gilbert wants, Gilbert gets.